The Andalusian horse is native to the Iberian Peninsula. With ancestors that have lived there for centuries, this breed is also known as the Pure Spanish Horse. The Andalusian horse was recognized as a breed on itself in the 15th century. Since then, it has earned itself the reputation of an excellent war horse. Highly valued by the nobility, the Andalusian horse was heavily used between the 1800s and the 1900s within Europe. However, crossbreeding, warfare and disease drastically reduced its numbers during these times. The ’60s marked the approval of Andalusian export from Spain. The breed scattered throughout the world and the numbers managed to increase once more. As of 2010, there are over 185,000 Andalusian horses registered in the world. The Andalusian horse is sturdy and yet it preserves a distinct elegance. Characterized by thick, luscious manes and long tales, Andalusians’ coat colors are commonly grey, but can also be black, white or brown. Dubbed the Horse of Kings, not only are they exceptionally built, they are also intelligent, docile and sensitive. With an average height at the withers of 61 inches (156 cm), weighing on average 1,130 lbs (511 kg), Andalusians are impressively elegant for their characteristics. Their heads are medium sized and they have either a convex or straight profile. The massive chest is accompanied by broad and long necks. The solid hindquarters ensure an energetic gait. A unique trait of the Andalusian horse are the “horns” that can appear around the ears and temples. Believed to be a proof of their Asian ancestry, the occasional bosses can be either calcium deposits or small protuberances. The beautiful gait of Andalusians paired with their agility makes them the perfect candidates for quickly learning tricky moves. They are great dressage horses and they excel at advanced collections. Descended from Iberian horses that roamed Portugal and Spain, there is proof of the existence of the Andalusian horse dating back to 30,000 BCE. Its lengthy history is bound to have been influenced by the various people that occupied Spain like the Romans and Celts, just to name a few. Recent DNA studies have managed to point out some similarities between the Andalusian horse and the Barb Horse native to North Africa. The discovery pointed toward the fact that Andalusians might be a result of heavy European horses and lighter Oriental ones. It was in the 15th century that Carthusian monks created stud farms for breeding Andalusians especially for members of the nobility. The breed continued to suffer changes throughout the 16th and 17th century while the Andalusians’ popularity only increased among the royal members of Europe including the Italian, German and French nobility. 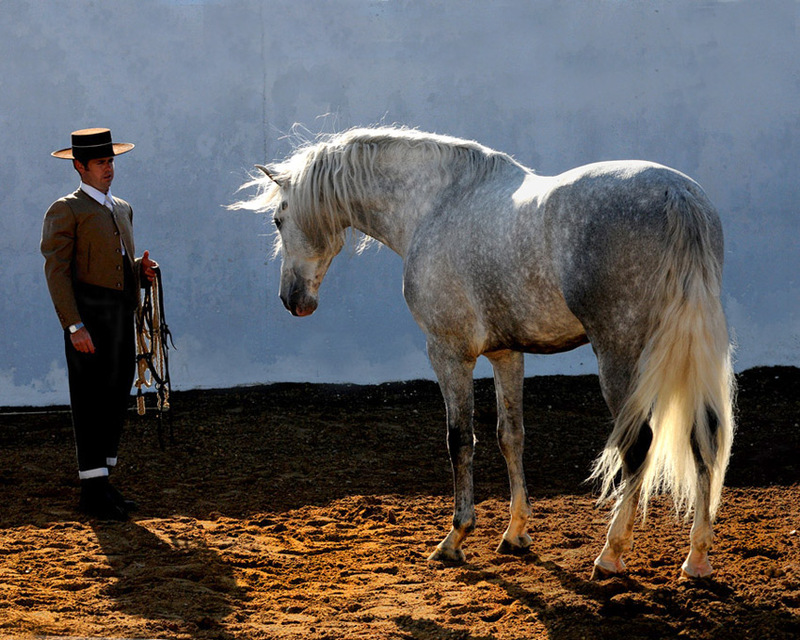 Although Andalusians have defended their reputations until the 19th century, another breed started stealing its limelight. Breeders started focusing on the Thoroughbreds, the Arabians and other crosses that involved the Andalusian horse. Andalusian international exports from Spain started in the 1960s. The first horses were sent to Australia and soon the newly formed Horse Association of Australasia started taking care of the registration of the purebreds. In 2010, there were almost 186,000 Pure Spanish Horses in the world, with 75% of them in Spain and the rest of 15% scattered throughout the world in California, Colorado, Texas or England. Best described by their athleticism, Andalusians have best been used over the years in races. They have earned the reputation of having the speed of light, known to be able to gallop for up to 15 miles without changing the pace. The Spanish military extensively employed the Andalusian horse, which proved to live up to the expectations of carrying a lot of weight and covering uneven terrains. Excellent for driving, riding and acing dressage, the Pure Spanish Horse has been in the lead for the most elegant and fast breed for centuries. 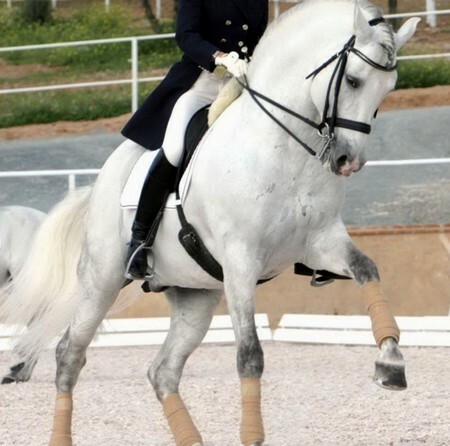 Even nowadays Andalusians are cherished in international competitions of dressage. However, the breed was no stranger to stock uses in the past. Ideal to work with Iberian bulls, only the Andalusian horse could match their feisty temperaments. Andalusians remain known for their role in mounted bullfights. Up to the 1960s, mares of the breed were used for threshing grain. The pregnant mares or mares with foals were supposed to trot over the grains for days. The process was believed to increase the endurance and hardiness of the Andalusian horse. The breed might no longer be used for working the land nowadays, but it is still on display on horse shows, jumping competitions and western pleasure. Its majestic appearance made the horse a favorite among movie directors. The striking profile of the Andalusian horse comprising a muscular build and an arched neck helped it be cast in worldwide famous movies like “Lara Croft Tomb Raider: The Cradle of Life”, “Gladiator”, “Braveheart”, “The Lord of the Rings” trilogy and “The Chronicles of Narnia: The Lion, the Witch and the Wardrobe”.